over the weekend i was looking through some old pictures and i came across this gem. it's a picture of us sitting at the light board console in the booth in the back the theatre. 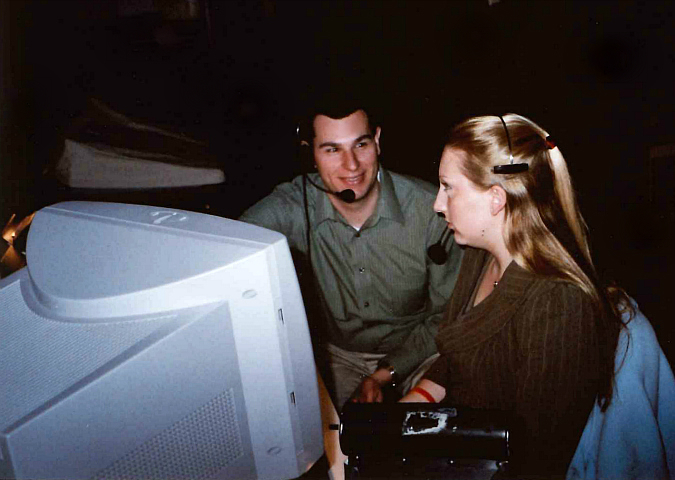 we were running the lights for a music concert (typical) and the date on the photo is march 2007.
seeing this photo was such a blast from the past. i never even realized that this picture was taken of us, but i do remember working that concert. i have no idea what was happening in that moment when the photo was taken, but i just love the expression on ryan's face. this was taken on a film camera before we had digital, so i had to scan it to share it (and to preserve it). it's fun looking through old photos and remembering things you had forgotten. this photo was taken before we were engaged or married. it was only 8 years ago, but it seems like a whole lifetime ago. That does seem like a long time ago. You both spent a lot of time in that booth! I agree that the expression on Ryan;s face is great. Does he still look at you like that? Or does he say, "What have I gotten myself into."